Doubles League - 2019 Please sign up by March 15 so a schedule can be posted. Scheduled to play on Saturdays at 9:00AM. Teams can reschedule, if needed, only if both teams agree on an alternate date which must be played before the next month’s scheduled play date. The match will consist of 6 ends with the winner of each game awarded one match point and one match point will be awarded to the team with the most total game points. Social Saturdays April 6 and September 21 at 9:00AM. Bring a snack to share and some quarters (25 cents) for added interest. 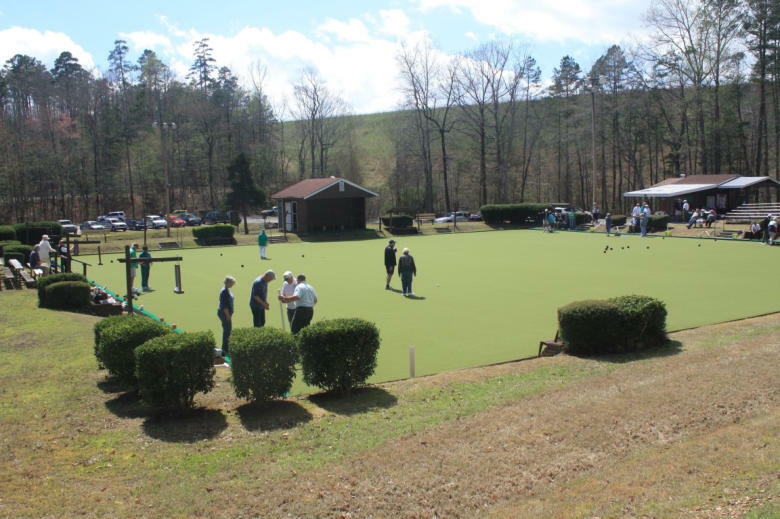 Socialize and play some fun variations of the regular lawn bowling rules. No sign up, Just show up. If you’re looking for a fun, low-impact outdoor activity, lawn bowling is for you! Please join us and find out what Lawn Bowling is all about. Lawn Bowling has nothing to do with rolling a heavy ball and knocking down pins. All equipment and instruction are provided. Located off Toledo across from the Dog Park.